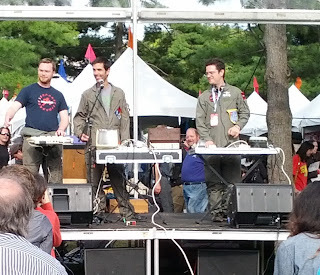 My daughter and I went to the 2012 NYC Maker Faire at the New York Hall of Science. I really like the idea of the Maker movement: build your own objects and art using technology. It is a broad movement, the quality of the projects vary. It is inclusive, artistic, science-y and often attention seeking. In other words a good candidate for a youth culture that I would be happy with. I have followed NYC makers on a TV show called nyc 2.0 hosted by Rick Karr. 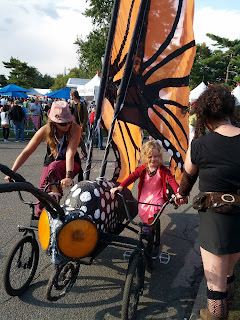 I was a little surprised at how many baby friends we met at the Maker Faire, given that they are all working scientists, guess it shouldn't have been surprising, but it felt good to see that I was not the only crazy dad who brought a young kid there. My daughter has always liked robots, and we found a workshop for building a SpinBot. There was a hour of wait, but she was very excited. Robotics purist would be horrified about the SpinBot, no power tools are required, it is only a tripod with a little engine on one leg and markers on the other two. It does take good focus and fine motor skill to connect the wires from the battery to the engine. Glue on a battery and you have the world's simplest mobile robot. 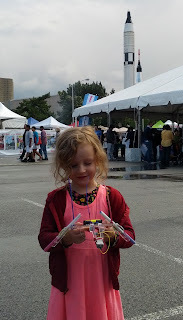 And that is all it took to build her first robot. Time to take it for a spin. That is one creative robot. I didn't know whether my daughter had aptitude for science or not, but for the first time I thought maybe she actually has both interest and some talent. It was a happy daddy moment. Time with good concentration is usually followed by time with very wild behavior. We barely made it out of the subway before she got really rambunctious. We listened to several bands neo techno, indie rock, and circuit bended music. Going to see music shows was important for me when I was young. I am not sure how she responded to it, but it is great that she got exposed to it. As an experiment I started teaching my daughter about science when she was 3 years old. She did not really understand much. Jean Piaget's developmental stage for abstract reasoning starts around 11 years old. So I thought she would only be able to understand science at that age. I took her to science museums, but mainly considered my experiment a failure and gave up on trying to teach her about science. Recently she has started to insist that I read in her science books at night, and she really understands much more at 4 than at 3, and I can ask her questions and see that she actually has retained some of what we have read. Why are my findings different than what I expected from Piaget? The greatest reward is that she is excited about science and she seems like a curious kid. Here she is having a moment with the universe watching cosmic rays in a bubble chamber.